Today the cutest and most precious little guy IN THE WHOLE WORLD — our 2-and-1/2-year-old grandson Capt. Adorable — came to our house. Usually I travel his way for a visit but this time he got to come to Kacky’s house. I was thrilled. We had a blast! Our cats … not so much. I mean, all he wants to do is hug them. That’s not so bad, right? This entry was posted in Alabama, family and tagged babysitting, cats, children, family, grandchildren, pets by Coffee with Cathy. Bookmark the permalink. So cute! He looks so comfy in the cat beds. 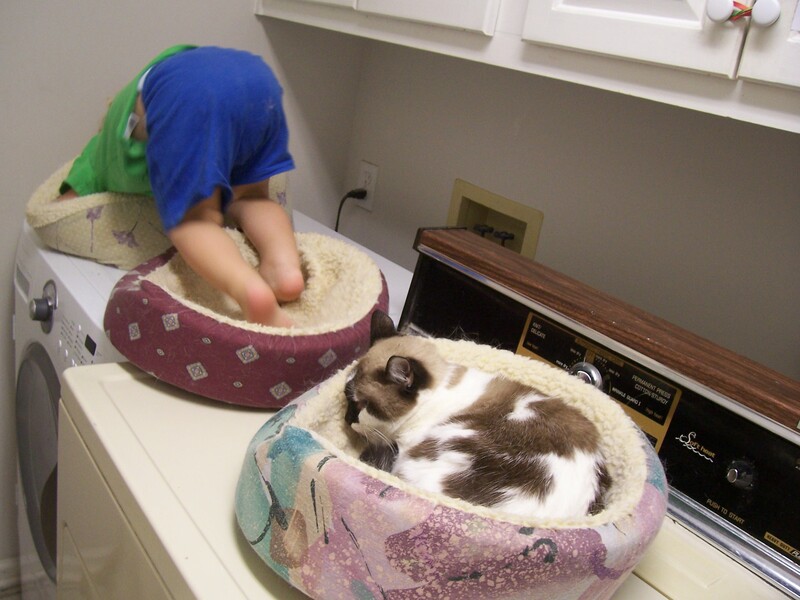 Just so long as he doesn’t head for the litter box…..
Oh, I think he’s tried that, too. Thank you, Evelyn! Are you taking notes?? ?